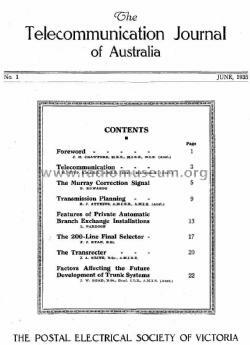 The Telecommunications Journal of Australia (TJA) is the official journal of the Telecommunications Society of Australia (TSA). Published twice yearly from 1935 to 2007. From 2008 it was published on line by Australian Computer Society and became ACS-TCS. The magazine keeps members informed of new developments in network infrastructure design, products and services and regulatory changes, in the telecommunications industry. 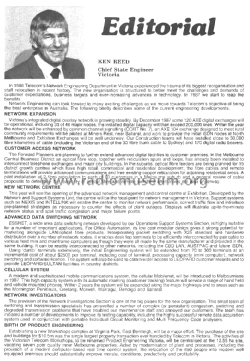 Produced by The Postal Electrical Society of Victoria June 1935 to 1959 and from 1960 to 1991 by the Telecommunication Society of Australia. The Postal Electrical Society of Victoria was reconstituted by the Postmaster-General's Department (PMG) in 1959 as the Telecommunication Society of Australia (TSA), an unincorporated organization, operating as a subsidiary controlled by the PMG. In 1991 a new regulatory regime, established by the 1991 Telecommunications Act, created a more diverse and more competitive telecommunications industry with infrastructure competition as well as service-based competition to Telecom Australia. In that same year the TSA was converted into an independent company limited-by-guarantee, designed to serve this new industry. 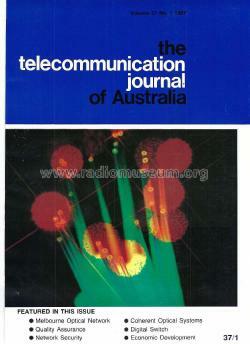 In early 2007 TJA's publisher, the Telecommunication Society of Australia, decided to transfer its assets, including the Journal, to the Australian Computer Society, to ensure the ongoing viability of the Society's activities. The TSA was thus reborn in 2008 as the ACS-TSA, a Special Interest Group within the ACS. 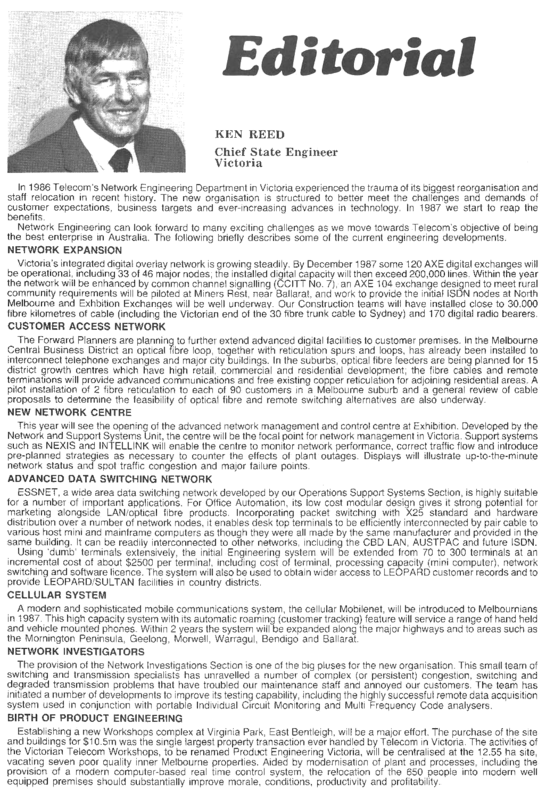 Abridged from: Peter Gerrand, ‘Celebrating 75 years of the Telecommunications Journal of Australia’, Telecommunications Journal of Australia, Vol. 60. No. 3, August 2010 (thanks to Gary Cowans for forwarding the information).